For Petite Women Who Want To Look "Nothing Short of Amazing"
The blogger writes, "Short Shrifted is a clothing and fashion resource for short men. I started it to combat the frustration I experienced trying to find a suit to get married in. Something that actually fit right. My whole life, I’ve struggled to find clothes that fit well, but that was the last straw. If you’re anywhere south of 5-foot-8, trying to buy clothes off the rack can be an exasperating experience. When it comes to clothing, short men have truly been short shrifted. But there are clothes out there that fit. It’s just a question of tracking them down. That’s why I started Short Shrifted. To connect you to the clothes, styles, stores, tailors, links and advice that best fit you." 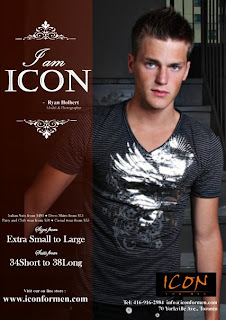 From the boutique's Facebook page: "ICON for Petit Men is a new apparel store that caters to males with smaller body frame/petit in the Greater Toronto (Canada) Area. 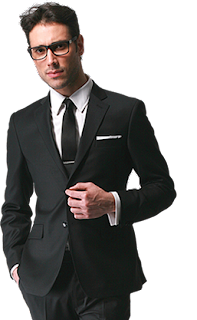 Our focus is to provide trendy, casual and business clothing and accessories for petit men and position ourselves as the top retail store servicing this particular market carrying our own brand and other fashionable high-end brands." The site claims, "ShortMenStyle.com is dedicated to helping shorter-than-average men find clothes that fit well and look good. For any man who is 5' 7" or under, you know how hard it can be to find pants with a short inseam or short rise, shirts with the proper sleeve length, suits that are proportioned appropriately, or workwear that isn't too baggy. 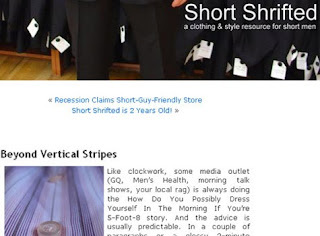 ShortMenStyle.com lists retailers and specialty stores that offer men's clothing in small and extra-small sizes (including sizes for short, heavyset men). . . . For men with small feet, ShortMenStyle.com also offers listings of shoe retailers that offer small sizes in men's footwear." The retailer's CEO writes, "Stylish, well-fitting, comfortable clothes inspire confidence. For the Fit, Inc. was founded by a couple of folks who recognized that not everyone had equal access to such clothes. We found that for those who are not an "average size" (and who is?) shopping was a chore and often fruitless. How did we figure this out? We're not average sizes ourselves and we got tired of running from store to store, only to wind up at the tailor for alterations anyway. So, we launched ForThe Fit.com. At For the Fit, Inc., we do the shopping for you. We find the best products in a range of sizes, styles, and cuts to best fit non-standard sizes. Fit can make all the difference in how you look and feel in your clothes. For the Fit, Inc. wants to make the difference for you. From the clothes we offer to the services provided- we aim to FIT your needs." The retailer's website boasts, "Napolean's Tailor is elegantly tailored fashionable short men's clothing. For the handsome shorter man, 5'8" or under, a great fit and great look is elusive in conventional men’s departments. 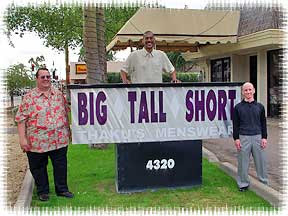 Proudly serving shorter men in the metro Milwaukee market with retail stores catering specifically to the short man and the rest of short American men via the internet, Napoleon’s Tailor is determined to make short men look fashionable and fitted… AND maybe even feel more confident with high quality, en vogue, stylish short men’s fashions. Why do short men tolerate the loose fitting saggy crotch look of conventionally sized men's pants? Why would you as a short man accept the spare tire cowl over mid section of conventionally sized sweaters? Why do short men accept the bunched up, rollover of conventional bomber jackets? Napolean's Tailor fits clothes to shorter men not shorter men to clothes." Thick as Thieves menswear. Artisanal features at affordable prices. An amalgamation of vintage chic with modern relevance. Why be just another face in the crowd? Thick as Thieves spearheads a renaissance of men who see tailored wear as something to wear socially, in the evenings and on weekends, and who understands the suit is a focal point of a solid wardrobe. To put it simply, Thick as Thieves aren’t for men who need to wear a suit, but for men who want to wear a suit. Because our suits are not mass produced, each garment is its own unique outfit with its own personality. We produce limited runs in each fabric so it’s almost certain you’ll never see anyone else wearing the same suit as you. The website announces, "Jimmy Au is a pioneer and leader in the design and development of clothes for short and small men. Here you will find the world's first menswear collection where clothes for short men are not an afterthought of the mainstream market, but the purpose of its design and development. Jimmy Au specializes in designing clothes to look, fit and feel more comfortable, fashionable and proportional by using a complimentary combination of high quality fabrics, flattering patterns, and relevant, porportional style details. Jimmy Au's has been an entertainment industry secret since 1982. Because of the height enhancing qualities of the Jimmy Au Collection, it is the preferred wardrobe choice of the television and film industry when it comes to fitting short actors and celebrities. Nothing beats coming into the store, but if you can't make it in, we are happy to introduce to you our new online store. What you see online represents only a small part of the collection you would see shopping in the store, but it would at least give you a taste of what we do. Happy shopping and we hope to see you actually in the store one day! Located in the heart of Beverly Hills in the Golden Triangle, Jimmy Au's For Men 5'8" and Under is the first and still the only designer clothing store for short men in the United States. At 3200 square feet, it's also the largest short men's clothing store of any kind in the nation. . . .We carry sizes exclusively for men under 5'5" and for men up to 5'8". No regular or long sizes here." The website explains, "In the early 1960's, Thaku Vaswani the Founder and President of Thaku's Big • Tall • Short Menswear had his humble beginnings as a custom tailor in Hong Kong. In 1968, Thaku opened the first store on Central and Camelback in Phoenix AZ. He continued the operation of custom clothier for the hard to fit man. The hard to fit man came in many different proportions, from the big man to the tall man reaching heights to 6'10". Due to his years of experience as a custom tailor, there wasn't a challenge even when a gentleman who was 5'2" also wanted custom made suits or shirts. Then came the athletic men whose difference from chest to waist was unbelievable; yet this feat was also conquered by the tailor from Hong Kong. Despite the extensive array of sizes, we carry in our inventory from a 34 Extra Short to a 70 Portly Long, which are sizes generally never found in one store. We are capable of fitting anyone from the Bar mitzvah young man to the gent who may be 7'4" or to the prosperous looking gentleman weighing at 400 lbs. . . . We all look forward to either seeing you at our Scottsdale or Peoria (Arizona) locations, or serving you on our website." This custom-fit retailer explains, "Indochino is the pioneer and global leader in online custom suits. With an innovative approach, not only do we provide stylish suits in fine fabrics at the best price with the fastest delivery time, we're revolutionizing the way men dress. 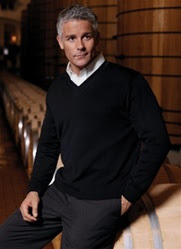 We believe an entire wardrobe of clothes custom made to fit just right is the future for a discerning guy of style. So we decided to make it easy with unique measurement profiles, an ever evolving catalogue of both classic and fashion-forward suits, shirts and outerwear, plus an unparalleled number of customization options.. Indochino offers a unique balance of accessible fashion and traditional made to measure suits by putting the power of bespoke in your hands." The website proclaims, "Janine Giogenti is passionate about your image. A fourth-generation Italian Designer, her custom made shirts are made with Old-World craftsmanship, cutting-edge technology, and a commitment to customer satisfaction that is simply unmatched in the custom clothing and fashion industry. Her numerous media appearances and “Dress for Success” seminars have established her as a world authority on image enhancement - and a sought-after consultant for Fortune 500 executives. But you don’t need to travel to New York’s 7th Avenue or spend a fortune to take advantage of Janine's expertise. 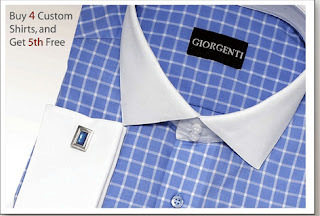 . . . . At Best Custom Shirt, our master tailors cut our quality custom dress shirts by hand - and they don’t cut corners. They use single-needle seams. They top-stitch our collars, cuffs and fronts with more than 20 stitches per inch, for a rich, supple look that stands up to the test of time and regular dry cleaning. And your measurements aren’t fed into a computer program. In fact, Janine personally reviews every order, and our Money Back Guarantee ensures that you get exactly the quality tailored shirts you want, the first time and every time." Last updated in June 2008, this helpful guide will help you find your measurements, explore the connection between testosterone and clothing size, and get tips on appropriate sizing and fit in shirts, jeans and casual pants, work gear, suits and formal wear, ties, socks, and belts. There are also weblinks to various specialty/custom stores for shorter men. Here's an excellent list compiling a first-rate collection of men's fashion blogs that will help the men in your life dress with style and confidence. Although not every blog on the list caters to shorter men, the general advice about dressing the modern man is of use to men under 5'8" too! I always like your blog post because you always comes with different ideas and information.Advantage of Tailor Made Dress Shirts is that they will be produced according to your size and you will have full control on the measurement. You can be assured that the suit will compliment your figure. No matter how simple a dress is, the person wearing a perfectly fit dress will always look at its best. But SHORTcuts is here to help! We know petite women deserve to look "nothing short of amazing" every day! That's why this blog is dedicated to helping us find the fashions that are "cut" with our "short" statures in mind. On a mission to help petite women of every shape and size look "nothing short of amazing" from head to toe.